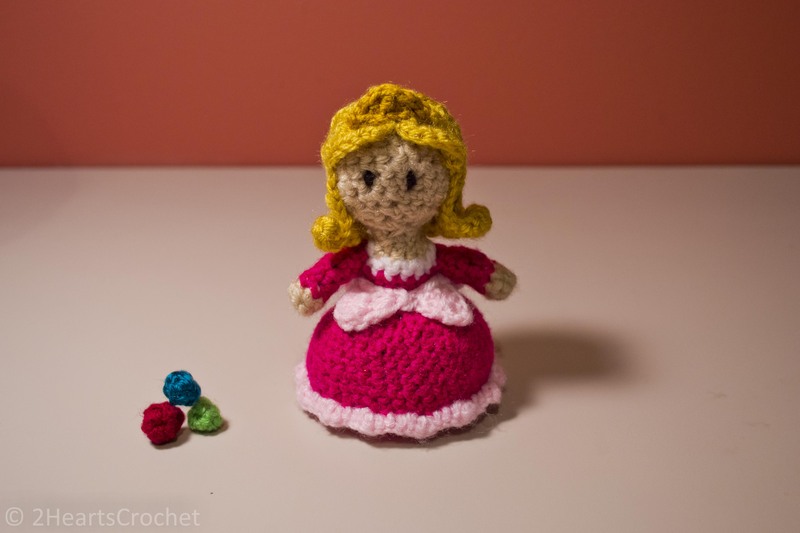 Once upon a time, there was a crafter who adored Princess Aurora. So she made her! I am SO excited about this pattern. I have always loved Sleeping Beauty, whether your version be Disney or Grimm. My biggest conflict in creating this pattern: pink or blue? 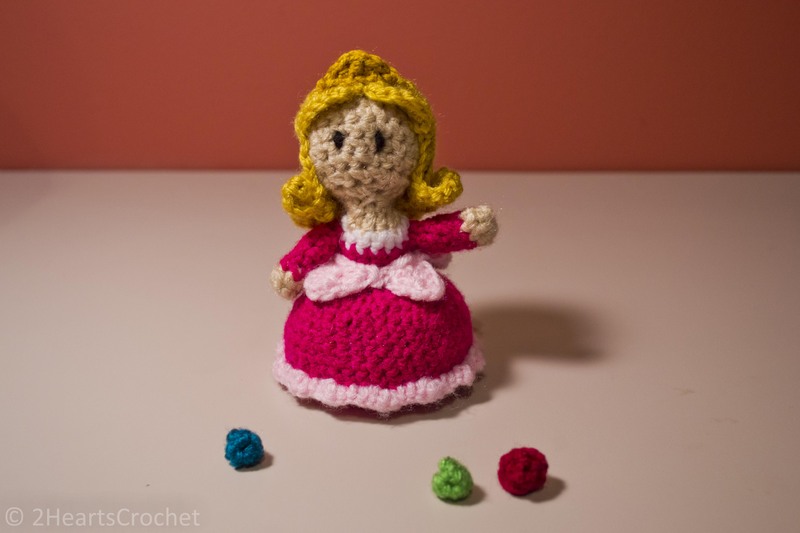 I even whipped up a pattern for Aurora’s three “aunts”, the fairies who took her into the forest to protect her from the evil Maleficent (also one of my favorites!). You know when they turn themselves tiny and fly around? That’s them! Little balls of brilliant, colorful magic. Rnd 1: In cream, make a magic circle. Work 6 sc in the center of the magic circle. Join to beginning of the round & tighten circle. Ch 1. Rnd 13: Work 2 sc in each st around. Switch to white, join and ch 1. Rnd 14: In white, work 1 sc in each of the first 4 sts, 2 sc in next st, 1 sc in each of the next 4 sts, 2 sc in next st, 1 sc each of the next 2 sts. Change to dark pink, join & ch 1. Rnd 21-24: Work 1 sc in each st around. Join and ch 1. Rnd 25: Work 1 sc in each st around. Switch to light pink, join and ch 1. Rnd 26: In light pink, working in the front loops only, *3 sc in first st, sc in in each of the next 2 sts* – repeat around. Switch to dark pink. Do not join. Begin rnd 27. Rnd 27: In dark pink, working in the back loops only, work 1 sc in each st around. Join to first sc st of the round and ch 1. Rnd 28: *sc2tog, sc in each of the next 4 sts* – repeat around. sc2tog the remaining 2 sts of the round. Join and ch 1. Rnd 29: *sc2tog, sc in each of the next 3 sts* – repeat around. sc2tog the remaining 2 sts of the round. Join and ch 1. Rnd 30: *sc2tog, sc in each of the next 2 sts* – repeat around. sc2tog the remaining 2 sts of the round. Join and ch 1. Rnd 31: *sc2tog, sc in next st* – repeat around. Join and ch 1. Rnd 32: *sc2tog* – repeat around. Fasten off. Use a tapestry needle to sew closed the remaining gap in the circle and weave in ends. Rnd 1: In light pink, ch 2. In the 2nd chain space from the hook, work 3 dc. Ch 2 and turn. Rnd 2: 2 dc, dc, 2 dc. Fasten off leaving a long tail. 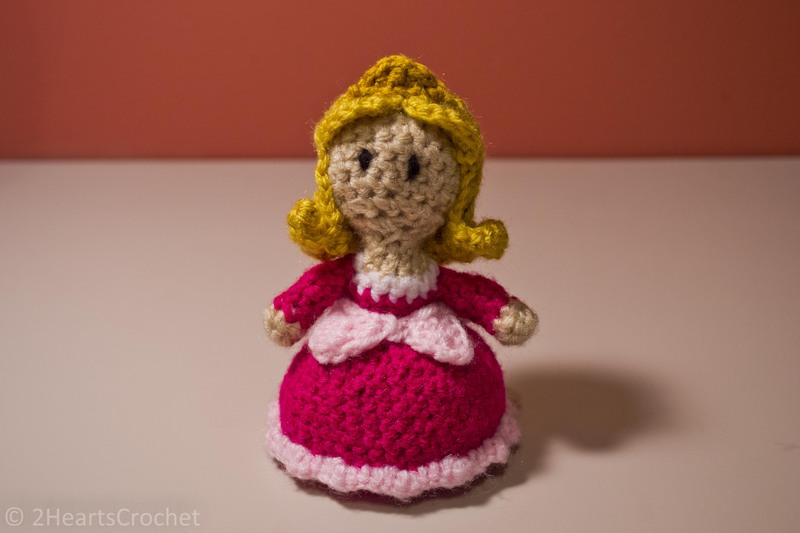 Use a tapestry needle to sew these triangular dress details onto the main part of the doll’s dress just at the waistline. Weave in ends. Rnd 2: sc around. Switch to dark pink, join and ch 1. Rnd 7: *sc2tog* – repeat around. Join and fasten off leaving a long tail. Use a tapestry needle to sew closed the remaining hole at the top of the arm. Sew to body just below the white trim/neckline of the dress. See photos for placement. Weave in ends. Rnd 1: In goldenrod, ch 21. Rnd 2: In 2nd ch from hook, sc across. Fasten off. Rnd 1: In goldenrod, ch 24. Use the diagram below to help with placement of each lock of hair. Sew the 5 back pieces on first, then the front 4 pieces. 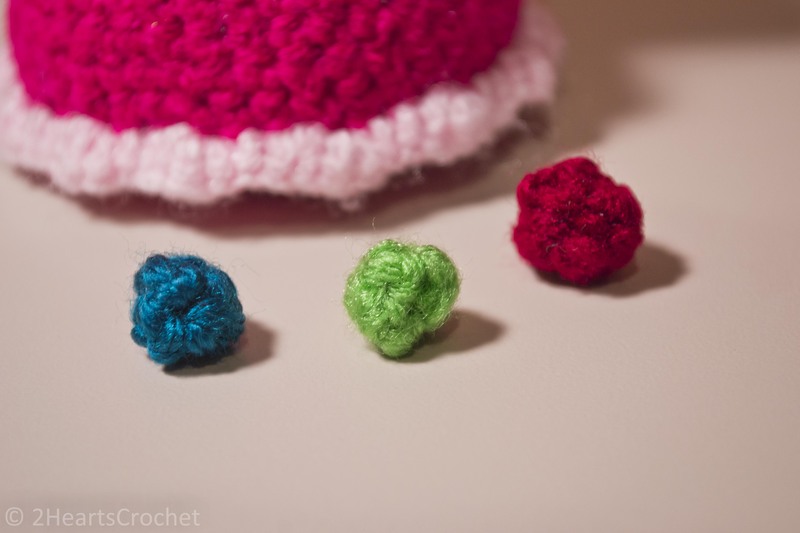 Make sure you are sewing them on so the ends curl upwards, not inwards. See photos for reference. 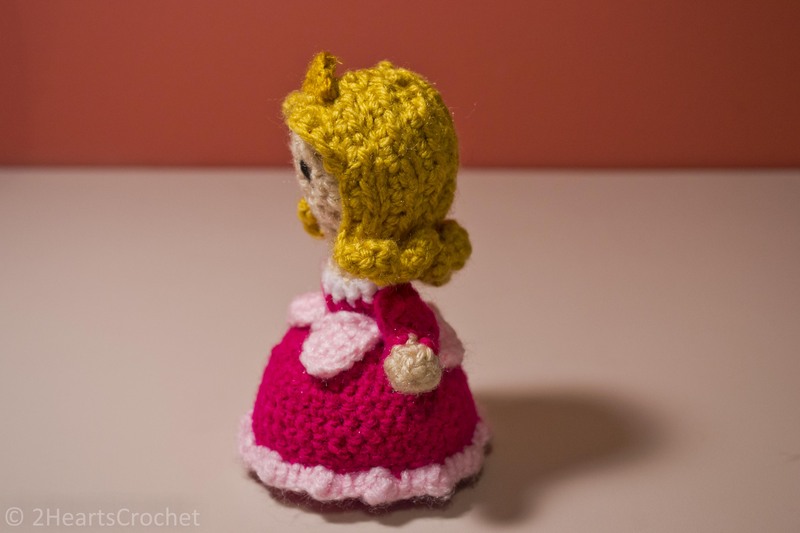 The object is to try to hide the seams and make it look like natural hair. Try different things if they work better for you! 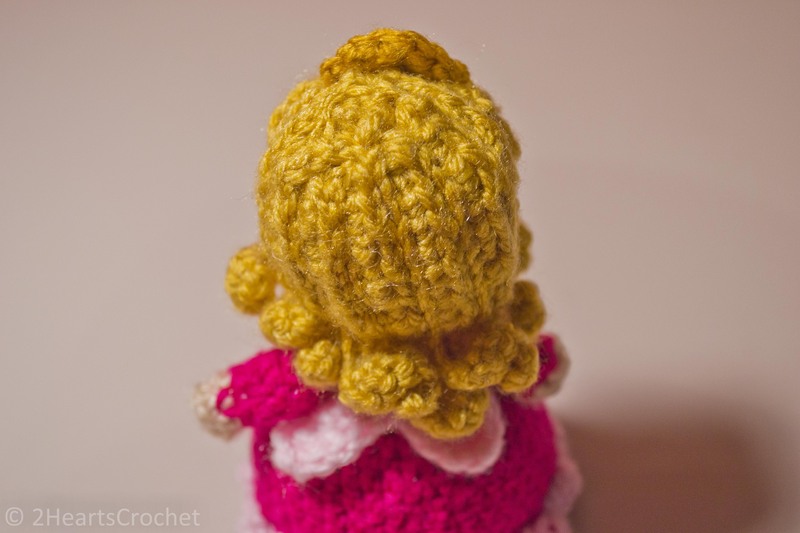 The back 5 hair pieces sewn onto the doll’s head. Note how they curl! Aurora with all of her hair (and crown) sewn onto her head! Yay! Rnd 1: In goldenrod, ch 7. Starting in the 2nd chain space from hook, sc in each of the first 4 sts, sl st in each of the last 2 sts. Fasten off. 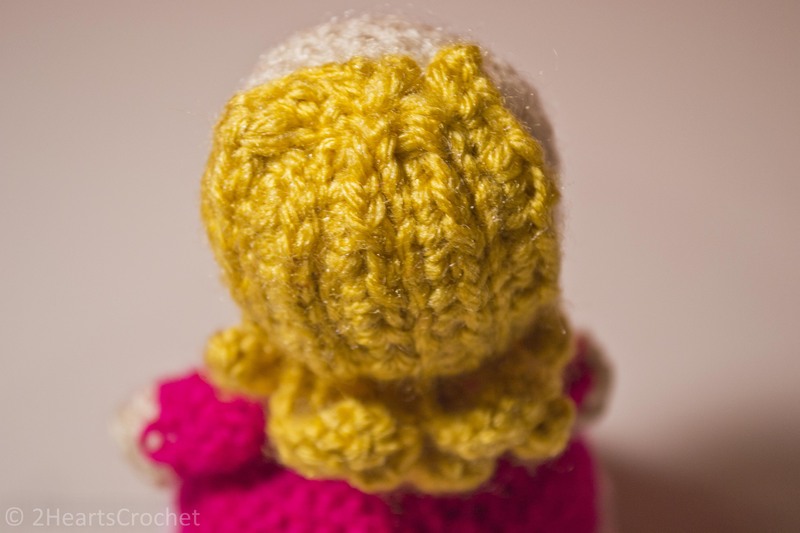 Use a tapestry needle to sew to the front of the doll’s hairline. Weave in ends. Rnd 1: In gold, ch 8. Starting in 2nd chain space from hook: sl st, sc, hdc, trc, hdc, sc, sl st. Fasten off, leaving a long tail. 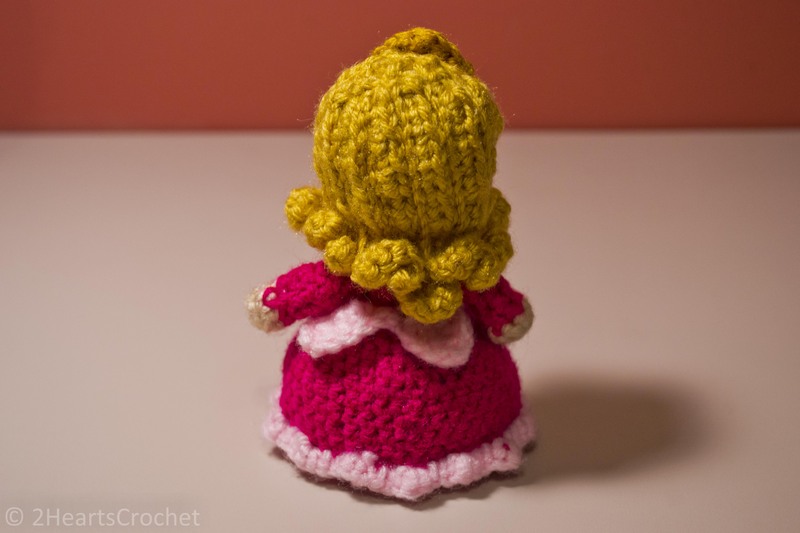 Use a tapestry needle and the long yarn tail to sew the crown to the top of the doll’s head just behind the bangs. Weave in ends. Rnd 1: In the pink/blue/green, make a magic circle. Work 5 sc in the center of the magic circle. Join to beginning of the round & tighten circle. Ch 1. Rnd 2: *sc2tog* – repeat twice. Sc in last st. Join and fasten off. Use a tapestry needle to weave in ends. I had planned to stage my photos with the fairies tied to tiny strands of white string and held aloft by some DIY apparatus, but I could not find my string this morning. So for now, the fairies are without their wings. Stay tuned for more princess fun! Next up is my another one of my favorites: Ariel!